Once you have selected your account, you need to fund the account with some money, so you can start vending. A Wallet is where we keep the money you fund into your account. A Wallet also allows you to properly track how you use your funds(especially if you manage agents). There are two ways to add a wallet to your account; from the Dashboard > Wallet > start or click Wallets from the top green top bar menu. On the wallets page, click Add a Wallet from the right corner of the page. Name: This will be the name of the wallet. 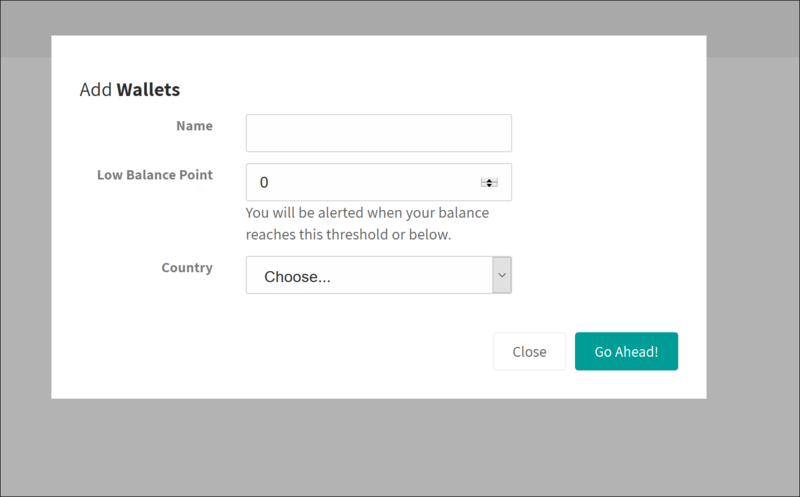 Low Balance Point: The value you provide so we can alert you when your balance reaches this point. Country: This is so we show you only services available in your country and also to deduce your currency of operation. 3. After you have provided all details, click Go Ahead! to create your wallet. You can now Fund your wallet and start selling.